Kenkeleba House is an initiative that attempts to provide the surrounding community with not only a place of beauty or escape but an area for artists to display their works (specifically sculptures). The initiative started in ‘79-’80 by current manager, Corrine Jennings. Jennings had been a resident in the neighborhood for decades and wanted to revive a small part of the community. 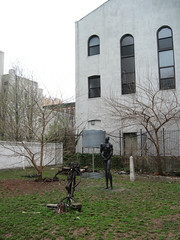 The garden’s initiative bleeds into the art and cultural community of Lower East Side. It has notoriety in the artistic community and it viewed as an essential contribute to cultural character of the area.